The Elegant Astronaut: What Just Happened? 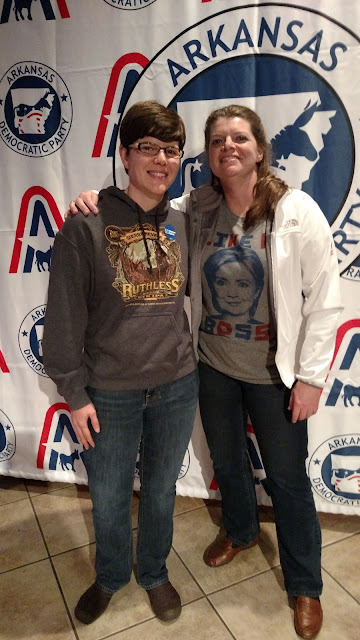 My friend Tracy and me at the Democratic Watch Party in Little Rock last night. I had trouble sleeping last night. I considered cancelling my classes today. Instead, I came to work dressed in solid black. One of my co-workers came to my office and asked me if I was okay. Not really. I stayed up late in Little Rock at the Democratic Watch Party last night. It was packed full of bright and interesting people. I saw wigs and pearls, Hillary t-shirts, business suits, glitter and heels. I saw a few men dressed in drag, and someone who looked like Bernie Sanders. I sat outside with my friends Tracy and Audrey around 10:00 pm, and a lady in a white dress jacket came out and said, "How the hell did we pass marijuana, but we can't carry a damn democrat in the state?" Interesting point. Arkansas continues to be a political enigma. One of my friends from Germany texted me early this morning. She said she thought the news of Trump winning the election was a joke, and then she offered me a place to stay. She was serious. I cannot see how a person who exemplifies male toxicity by intimidating and belittling women has won a democratic election over another person, who, by ANY account, is simply THE MOST QUALIFIED, THE MOST EXPERIENCED, PRESIDENTIAL CANDIDATE in the HISTORY OF THE WORLD. And the part that turns my stomach is the fact that THE MOST QUALIFIED, MOST EXPERIENCED, PRESIDENTIAL CANDIDATE IN THE HISTORY OF THE WORLD just happened to be a woman. What the $%@# is going on here? ?